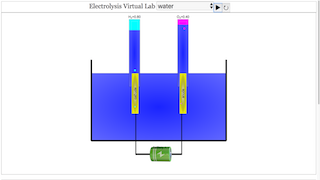 You are using a virtual laboratory developed for simulation use. The system consists in a hydrogen electrolyser and its pressure cleaning processing. Main window is displayed on the right of the screen with a full drawing chart. To begin with the simulation, set up initial conditions with intensity and producing slides bar and press play button.